When you get engaged, that ring changes everything. It steers the course sharply into "bride- or groom-to-be" territory. And that new territory has some fun new lands to be chartered and enjoyed! Attending bridal events and shows is a bit of a rite of passage. It's the one time in your life you can dive into all things weddings, be inspired by trends and ideas in real person beyond Pinterest, and come out victorious with a dream vendor team, a wedding prize, or a kick-tail day out with your closest friends and family. Hampton Roads totes some pretty wonderful bridal events, and one annual event especially excites us all. 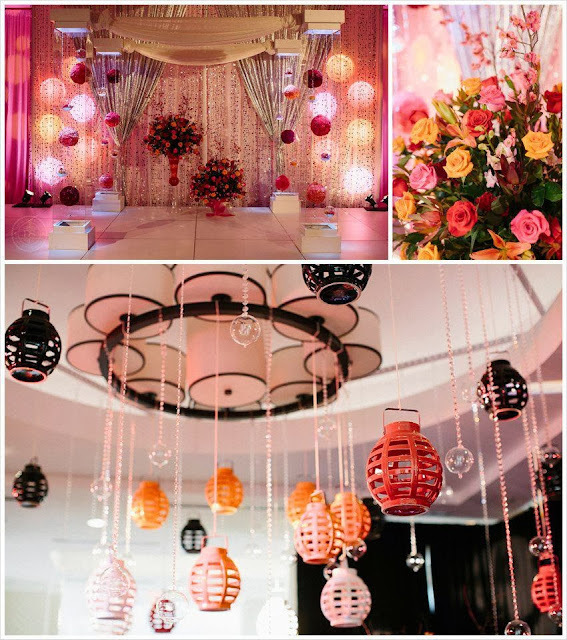 Before the energetic hubbub of the Uniquely Yours Bridal Showcase (UYBS), there is one memorable evening to set the stage in a more intimate and personal setting: the Soiree Event. Every year, Pearl Taylor and her team host a fabulous evening featuring a respected wedding guru speaker to inspire brides, grooms, and their loved ones. 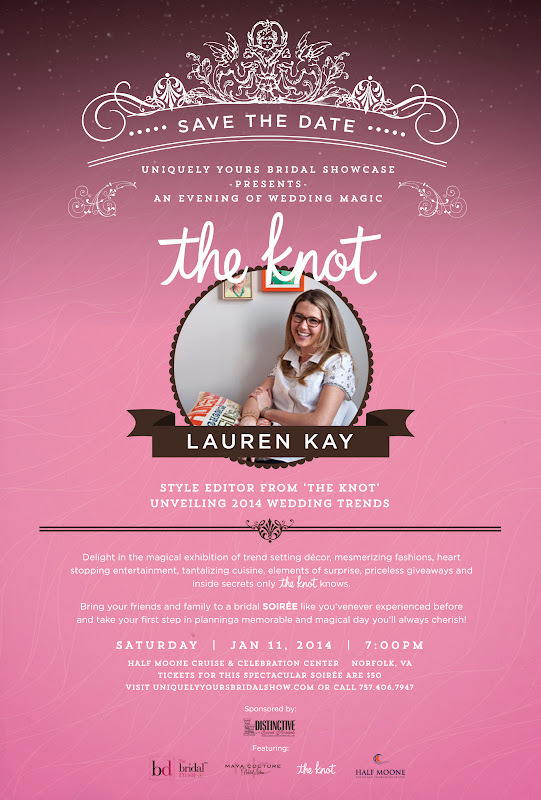 And this year, on January 11, 2014, The Knot's very own style editor, Lauren Kay is the star! We are going to get the scoop on 2014 wedding trends and some insider secrets to what The Knot knows. But it gets even better for us locals, while Lauren inspires verbally, the Half Moone Cruise and Celebration Center will inspire visually through delicious treats, trending florals and fashions, and gorgeous reception tables. The giveaway ends on Sunday night, December 15, 2013, and the winners will be announced on our Facebook page Monday afternoon on December 16th. Winners will be able to pick up tickets at "will call" on the evening of the event (January 11, 2014 at 7:00pm at the Half Moone Cruise & Celebration Center in Norfolk); please be sure to bring an ID. To purchase tickets, head over to www.uniquelyyoursbridalshowcase.com. Not available for the Soiree or want a full fun-packed wedding weekend? Be sure to stop by Norfolk Scope for the big showcase on Sunday, January 12, 2014! Brides, you get complimentary tickets! Guests are only $10, and all proceeds go to the Susan G. Komen Foundation. Fun Fact: The really cool part is that over the past five years, UYBS has raised over $30,000 for the Susan G. Komen Foundation.